We started on a new quilt. Its a beauty and different than most we have worked on recently as its asymmetrical. Not the dimensions of the quilt but the pattern on it which seems to be an unusual feature. Its going to be enjoyable to decide where to sew as between the colors we will have to fit in different size designs. Its not often that once we decide on the quilting design that there is any creativity. Mostly we just continue with the set pattern over and over again. But this particular quilt was laid out so there are not standard distances between the colored parts – some are close together, others farther apart. Even though we just began it, I am already looking forward to how it will turn out. For some reason working on this quilt made me think about habits. Habits seem related to symmetry. They add a set pattern to our lives. We can be on auto-pilot to brush our teeth, get dressed in the morning, make coffee, go to work or the grocery store. And then there are those moments in life when we are forced to actually think about what we are doing, make decisions about how to do something, be creative, find a different pattern or even work without any pattern at all. Sometimes this can be enjoyable for instance when we are on vacation and find ourselves in a new place. Or it might be uncomfortable when some change in our life disrupts an old pattern and we need to find a new one. I suppose there are people who live without any patterns – but I don’t think I’ve met them. Just as there are people whose lives seems to be a continuous pattern, perhaps those who are part of a monastic order. Most of us probably fit somewhere in between. Personally I enjoy occasional bouts of asymmetry, to think about what I am doing and why. To look around, ponder the existing patterns and decide where to add new designs. What a nice thoughtful blog! I appreciate your comments about quilting and all the meanings it can bring to mind. Thanks for your comments, Nancy. 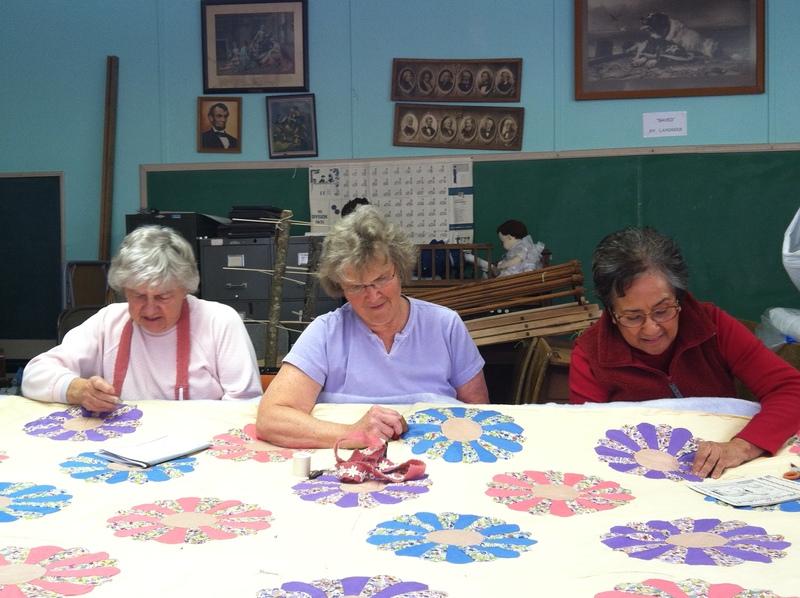 When I began quilting with these women, I felt there had to be some testimony to who they were and what they did. This is the only idea I could come up with . Some weeks there are six and sometimes up to a dozen. Often we have two frames up at one time so it is easy to fit any number around.